Where ordinary cars won’t pass – all-terrain vehicles will easily cope, because their purpose is to pass and sail where it is impossible to pass the principle. We’ve compiled a selection of the most advanced all-terrain vehicles of various types and purposes that are available for purchase. For expeditions, for hunting, for sand rally and finally – for entertainment. 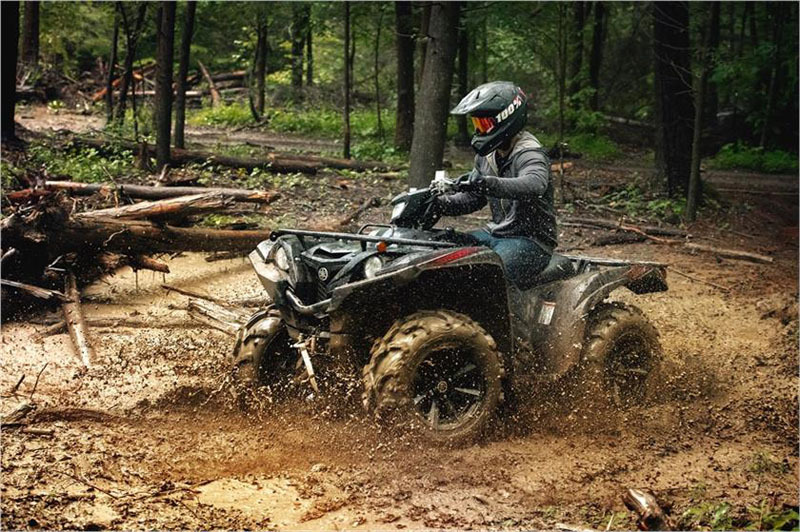 Primarily designed for off-road use, ATVs or All-Terrain Vehicles are motorized vehicles meant to scratch your recreational itch. Available in different styles and models, these mechanical monsters are incredibly versatile and customizable depending on their end use. The operator is supposed to straddle the seat and control the steering using the handlebars. Some ATVs accommodate a single individual while others support a passenger. But make no mistake – you cannot expect to hop aboard a random ATV and become king of the road; this isn’t a one-size-fits-all vehicle. Thanks to their rugged, sturdy, and multi-faceted builds, all-terrain vehicles can take on off-road jobs that cannot be handled by regular vehicles. 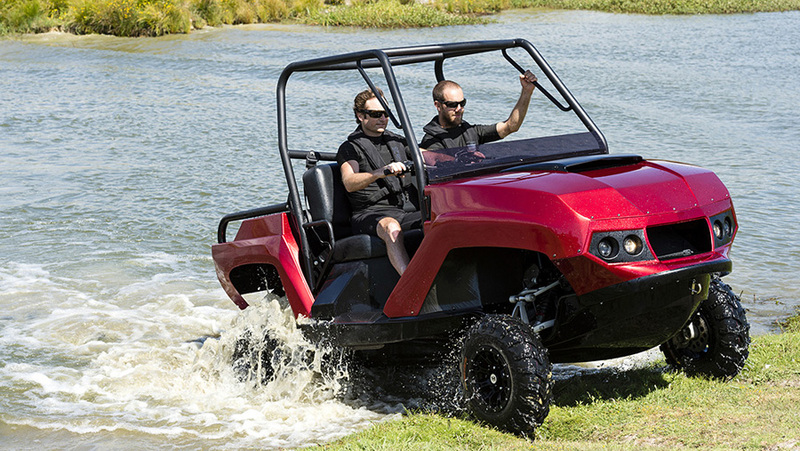 Amphibious ATVs provide greater reliability and passability. They are useful for transporting people and moderate-sized cargoes to hard-to-reach areas. These ATVs are extremely popular in the oil and gas industry, tourism sector, and geological surveys. What makes them different from regular ATVs is their ability to withstand a vast temperature range and altitudes. You can use them for traveling both on off-road and public road conditions, but the cherry on the cake is of course their ability to traverse water barriers. But despite their versatility, the overall ride experience is quite smooth and they protect their cargoes and passengers from any impact. 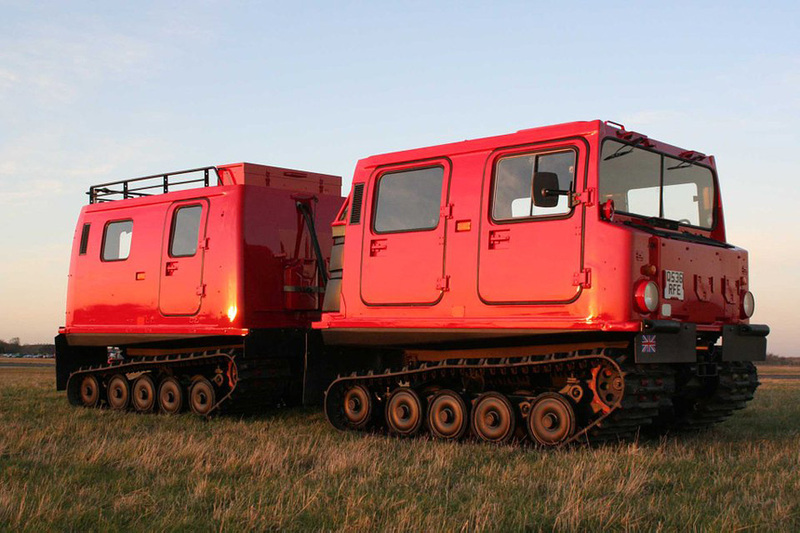 One of the main considerations behind the SHERP’s design was that it had to be easily reparable. The manufacturers worked hard to produce this vehicle that could be fixed almost anywhere with few tools and minimal expert knowledge. 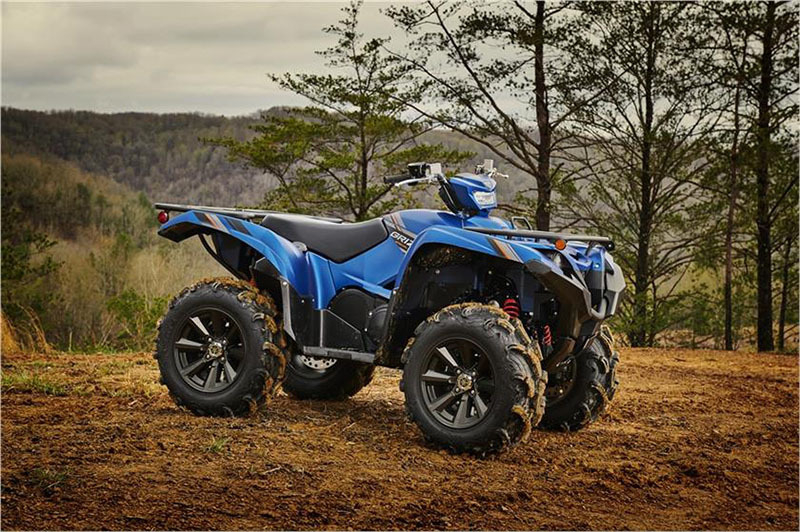 The vehicle’s transmission and suspension lack many of the traditional elements found in other ATVs but is incredibly reliable. The SHERP makes use of the bare minimum electrical appliances. 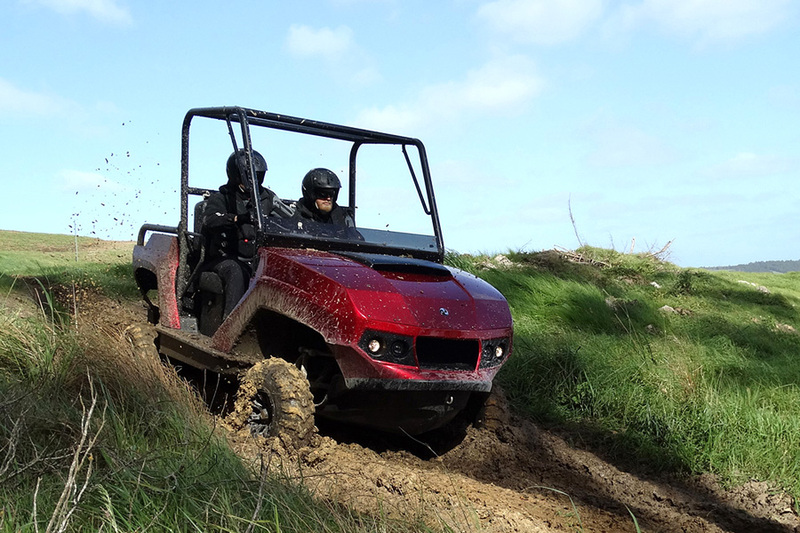 In fact, the engine of this ATV can function wholly without any electrical equipment. 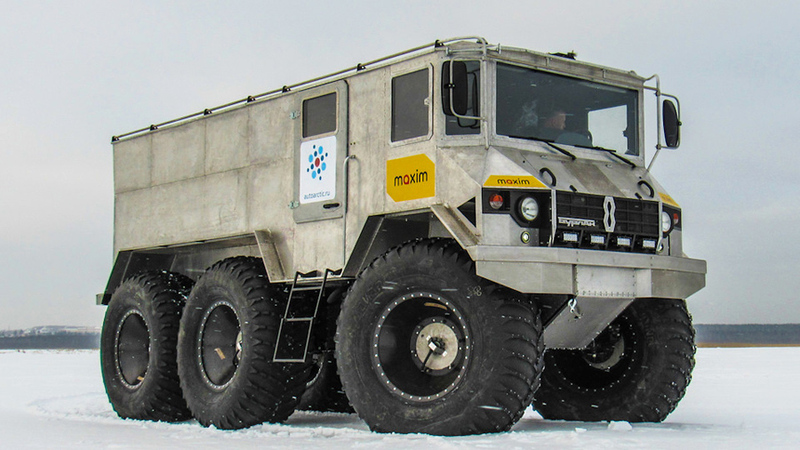 Every tire on the SHERP has a 800 liter volume, imparting the vehicle with a displacement capacity of over 7000 lbs. This means the vehicle can easily move in the water, and the hermetically sealed interiors remain free from any leaks. The SHERP can stay afloat even when it lacks all four wheels or has no tire pressure at all. 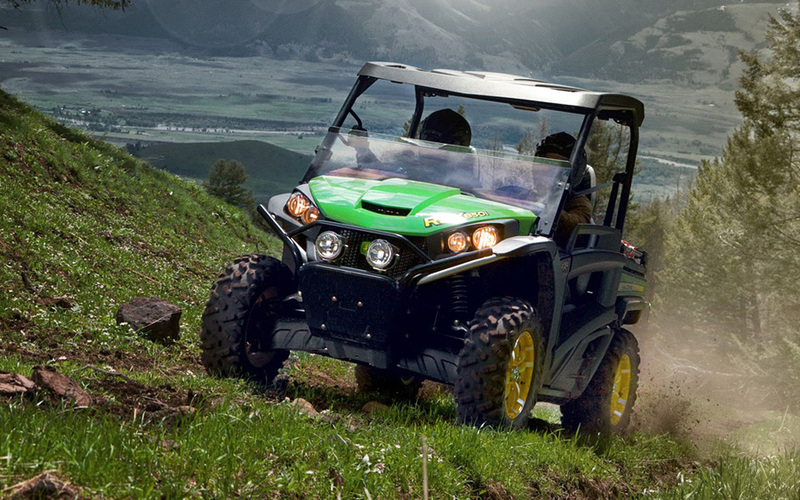 This is an off-track ATV that allows you to navigate over the toughest of terrains with ease. So, say goodbye to the hurdles posed by inhospitable terrain, like swaps, brush fields, talus fields, and forest floors littered with deadfall. The huge tires give it the necessary traction to roll through and over almost anything along its path. 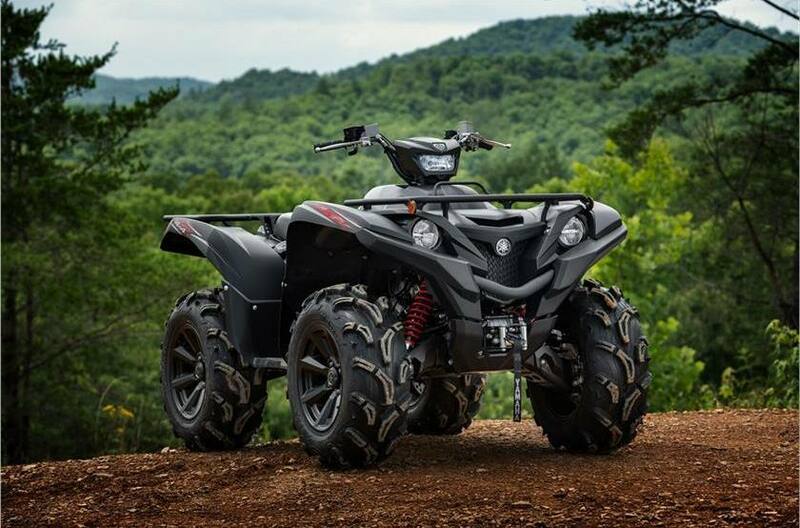 The manufacturers were thoughtful enough to include a tire-inflation system that enables the ATV to adjust easily to different types of ground demands. The 140-horsepower Gibbs Terraquad is capable of reaching speeds of 50 miles an hour, making it a surprisingly powerful beast on land. But the moment you take to the water, you start realizing the full capabilities of this vehicle. For starters, the Terraquad’s four wheels automatically rotate up and it is controlled by a waterjet instead. This jet propels the Terraquad to an impressive 45 miles an hour, almost fast enough to drag a water skier at the back. The UTV itself is capable of seating two people and is equipped with a small bed. 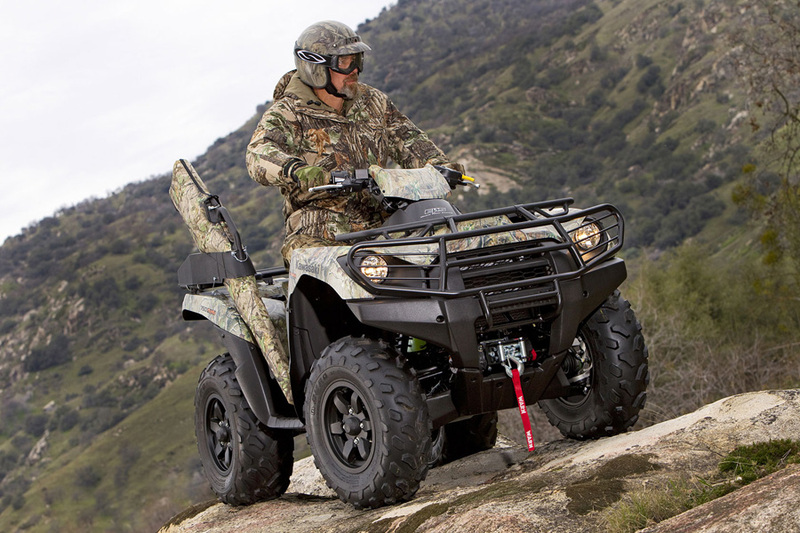 Meant to appeal to the most experienced recreational drivers, the Terraquad is likely to become a favorite among ranchers and hunters. 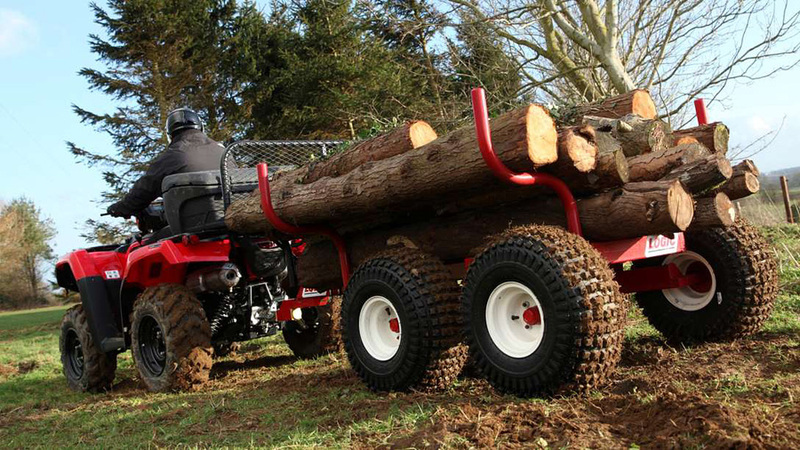 If you’re concerned about safety, the Terraquad comes with a Roll Over Protection Structure (ROPS) and dual seatbelts. 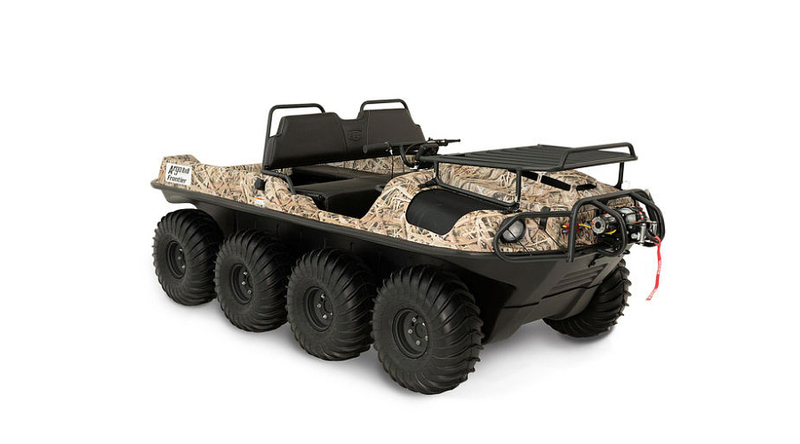 Manufactured by ARGO, the moderately-priced Frontier Series 750 Scout is an amphibious ATV with a 26HP Twin Cylinder EFI Fan Cooled Engine that offers you the versatility, entertainment, and power you need to tame the roads in any season. The vehicle runs on clean, dependable power, and despite its size, offers extreme maneuverability. 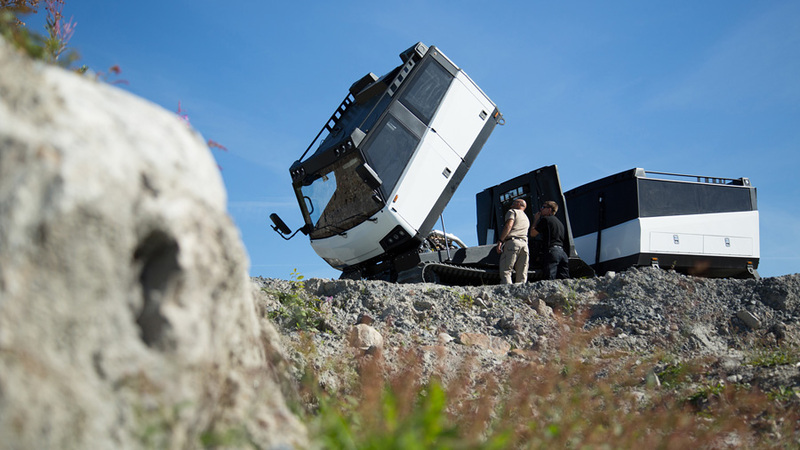 The vehicle can manage a zero-radius turn to overcome the harshest of terrains. 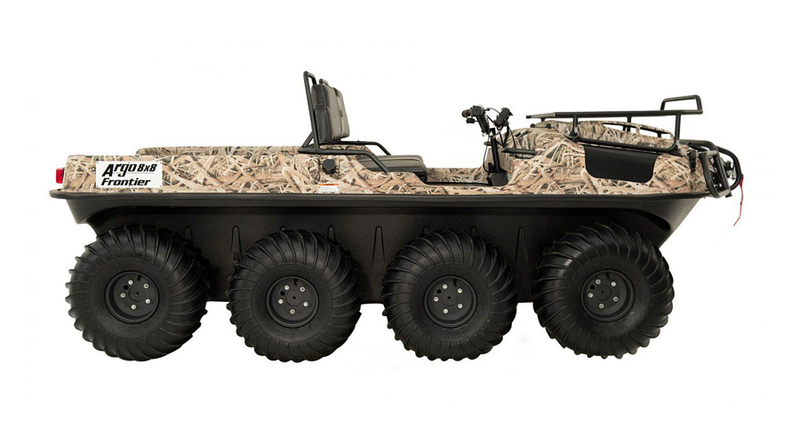 The tires of this ATV are low-pressure with steel offset rims. The paddle design helps propel the vehicle forward through water while the optimized traction is perfect for making your way through hostile off-road environments. 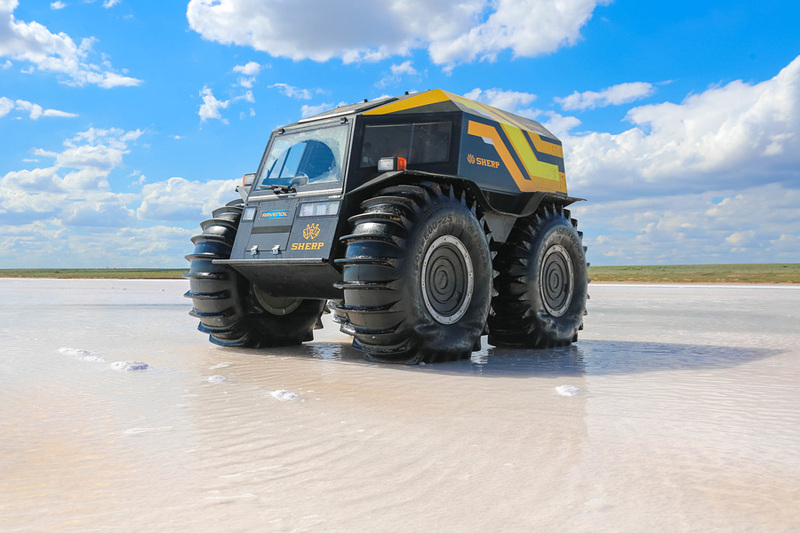 Powerful enough to carry you all the way to the North Pole safe and sound, the six-wheeled Burlak resembles an armored personnel carrier and with good reason. This ATV was initially a BTR-60 armored fighting vehicle, but was modified to become an unrecognizable yet efficient vehicle. 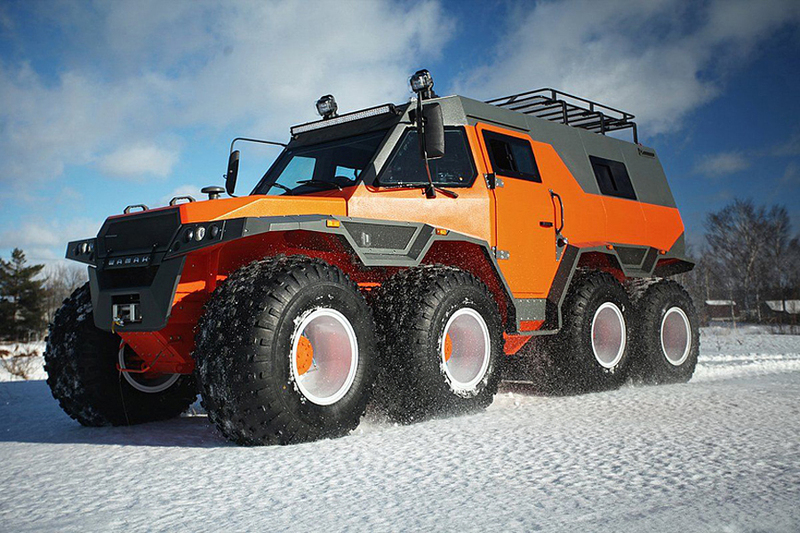 Thanks to its 3 ton load capacity, this monster can easily carry ten people and the body comes with heavy insulation. The interiors are fully furnished with a shower, kitchen, and more amenities. The engine and every system in the vehicle can be accessed from the house-type shelter’s interiors, which consists of a small space with the cockpit for the driver. If that’s not all, the Burlak even consists of a body and a propeller that enables it to float, so you don’t have to worry about sinking into the freezing Arctic Sea. Does driving off-road give you a thrill? Are you up for more challenging terrain? 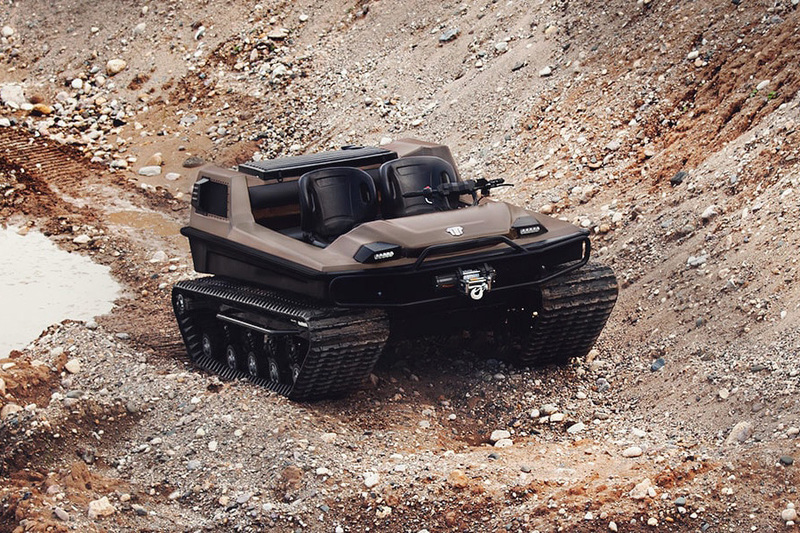 Then say hello to Russia’s best 8X8 contribution to the market – the WamahAvtoros Shaman amphibious ATV. 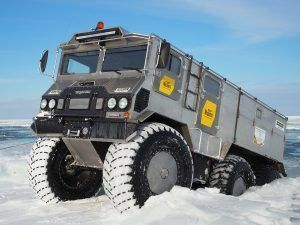 Meant for serious off-road travel, this vehicle can hold up to nine passengers and do everything, from floating to rolling to climbing. The model offers different drive modes, including Thruster Mode and Crab Mode. On land, the Shaman can attain top speed of up to 44 mph while its water speed in 1.3 mph. The underside of this vehicle features a hermetic boat-shaped frame that prevents water from getting in. As a safety measure, high-performance pumps have been added within the frame that eliminate water at 53 gallons a minute. The sheer size of this imposing vehicle enables it to use the general roads without causing any problems for other drivers. One of the reasons why the Shaman is a big hit with off-roaders is its capacity for responsive handling without any hiccups while maintaining amazing maneuverability. The eight-wheel drive system on the Shaman isn’t merely a superfluous addition to the list of specifications; it actually works in the driver’s favor, providing superb stability. 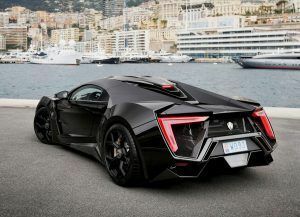 Plus, it doesn’t hurt that this ATV is stunning to look at and will garner a lot of attention from people on the road. 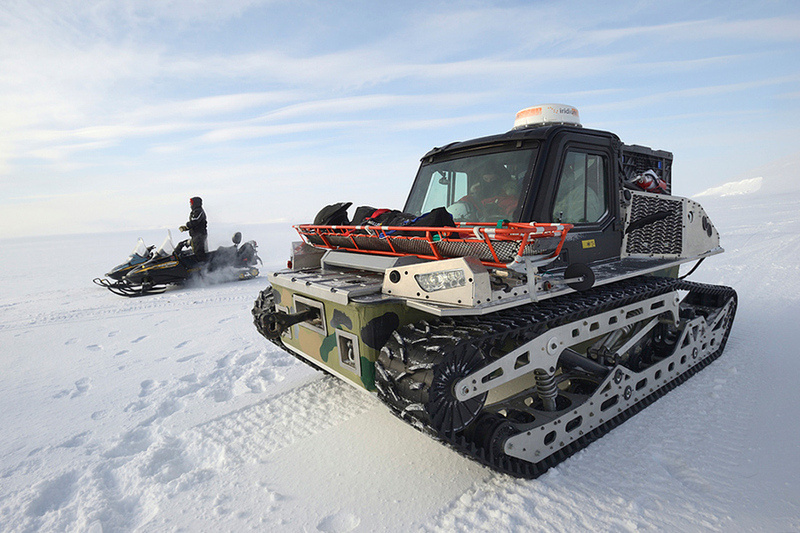 Tracked ATVs are ideal for wading through high snow cover. But they offer great performance year-round both with and without track conversions. 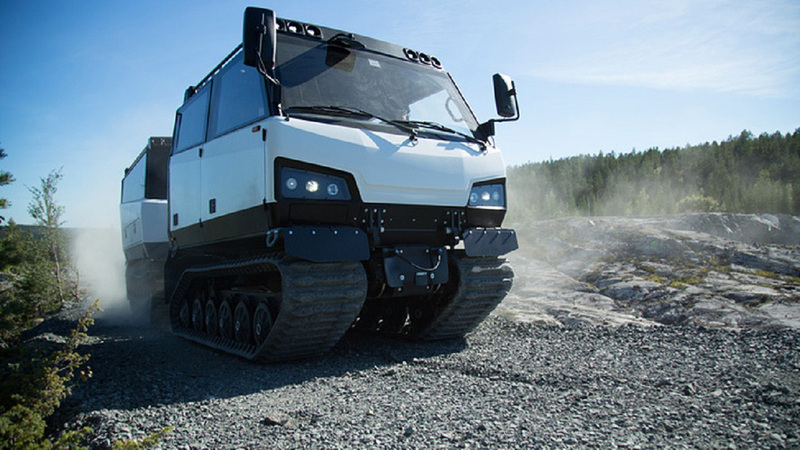 The tracked system helps heavy machinery in minimizing vibration, while the lightweight frame of these vehicles imparts the strength and power needed to self-clean mud, debris, and snow easily. Due to the inclusion of tougher tensioner adjustment designs, the weight distribution is even in such types of vehicles, and you won’t have a problem switching between wheels and tracks. The Hagglunds Bandvagn 206 has been designed to carry you across any terrain, be it rocky outcrops or marshes or boulder-filled terrain or roadless countrysides. 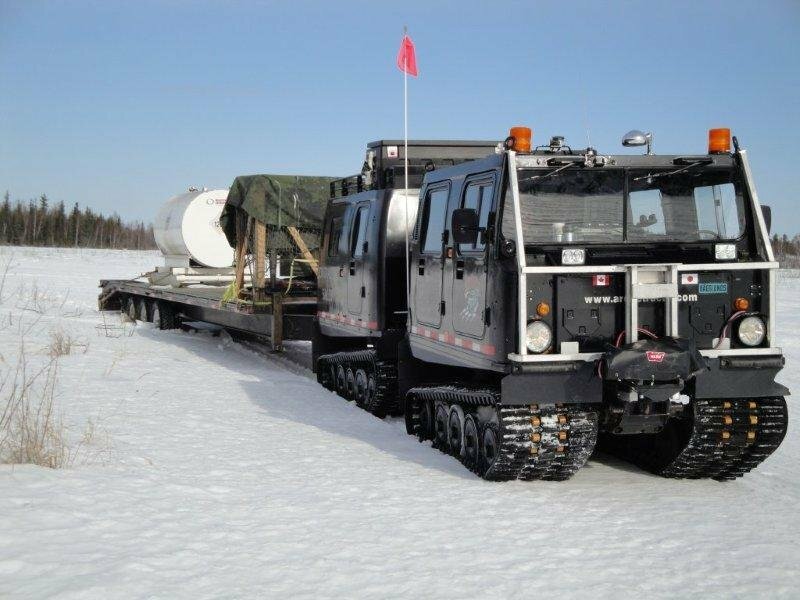 Designed for harsh northern climates, this vehicle can handle any terrain type and finds use in pipeline construction, forest firefighting, ambulance work, crew transport, relief work, tourism, and remote site work. The ATV puts minimal pressure on the ground and glides easily across road surfaces, attaining speeds of nearly 55 km per hour. 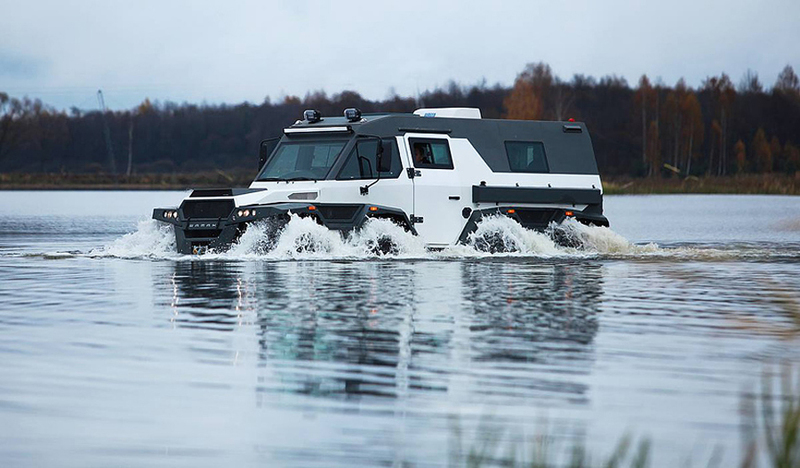 Being an amphibious vehicle, it can be driven directly into a shallow pond or lake. 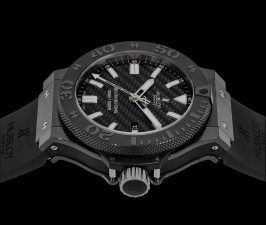 The steering gear features a servo which imparts flexibility during tight turns. Even fully loaded, the vehicle has a turning radius below 27 ft. The vehicle needs little maintenance and can operating expenses are minimal. The hill-climbing and traction properties of this vehicle are worth mentioning. 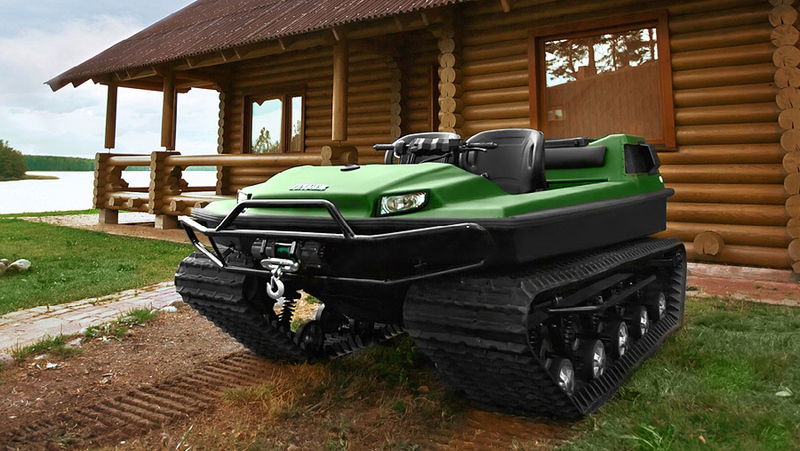 This handcrafted ATV was conceived for extreme public and off-road recreation. 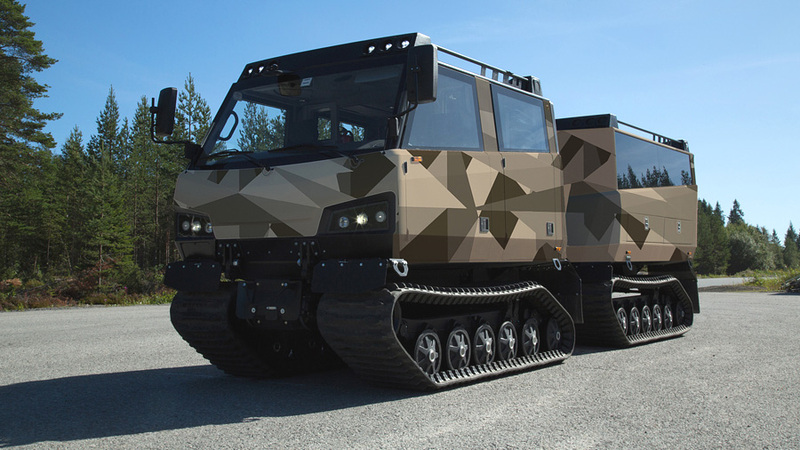 The base platform that the vehicle is developed upon is military-grade and is possible the quickest dual tracked ever manufactured. 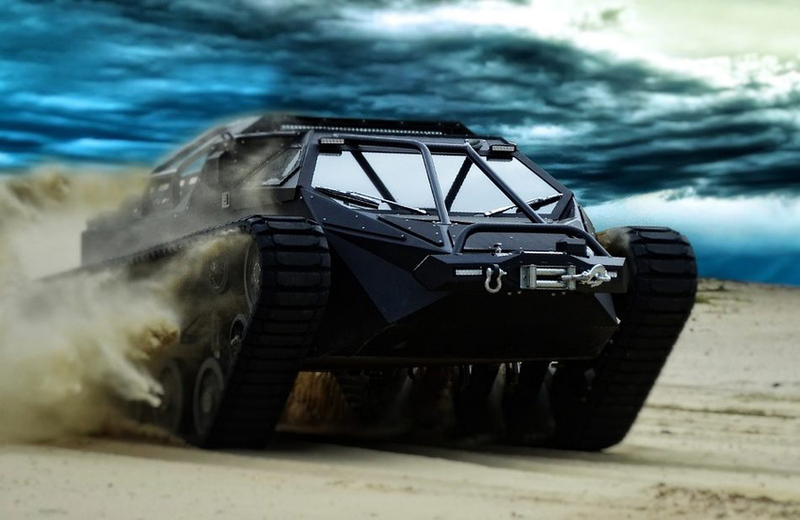 Due to the combination of a 600 hp 6.6 L duramax engine and Allison automatic transmission, the Ripsaw EV2 is capable of reaching speeds exceeding 60 mph. The hermetic hull comes in a aerospace-grade aluminum variant that provides floatation capabilities. 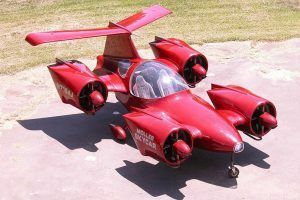 The vehicle is quite light for its category, weighing only 8000 pounds. 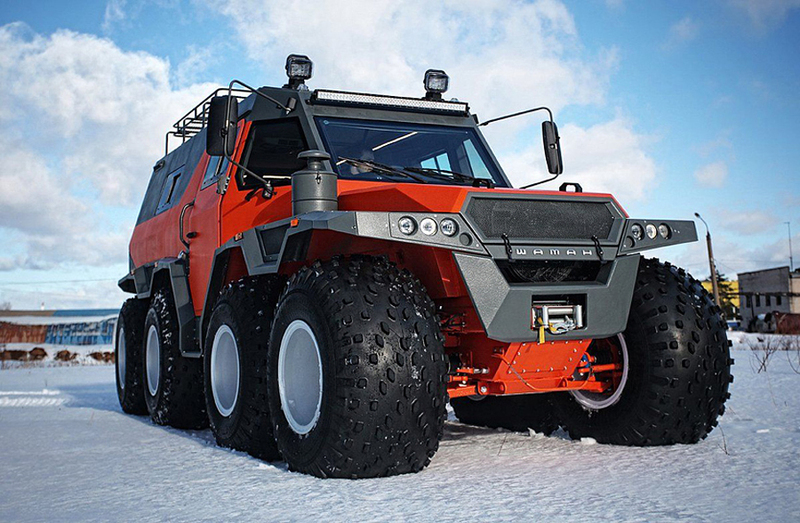 This is a multi-purpose off-road vehicle that does the job of five different automobiles – it possesses the snow-resistance of snow mobiles, the amphibious properties of amphibious ATVs, the ability to cross swampy areas like a swamp buggy, toughness against bad terrain like a quad bike, and transportation and work capabilities like a tractor. The four-stroke engine is extremely reliable and energy efficient while the tracks are made of reinforced, high-strength steel. Strong double chains are present along with a user-friendly steering. A lightweight but durable body and safe, comfortable seats make this vehicle a pleasure to handle for long hours. 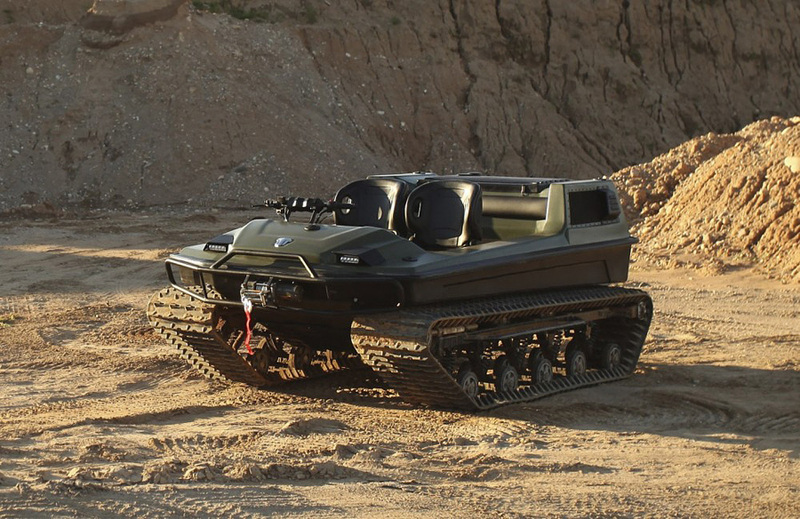 This amphibious vehicle gets its power from a 1000cc Polaris RZR engine, enabling it to reach top speeds in excess of 60 mph. 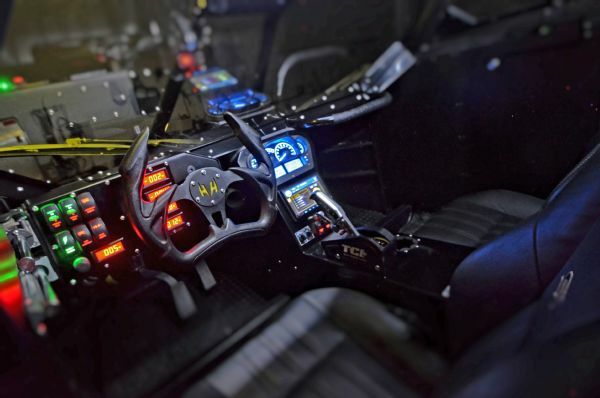 The vehicle relies on a standard steering wheel to control its dual track rotation. You can attach a shipping pallet on the rear if you want some extra gear for tackling rough terrain. 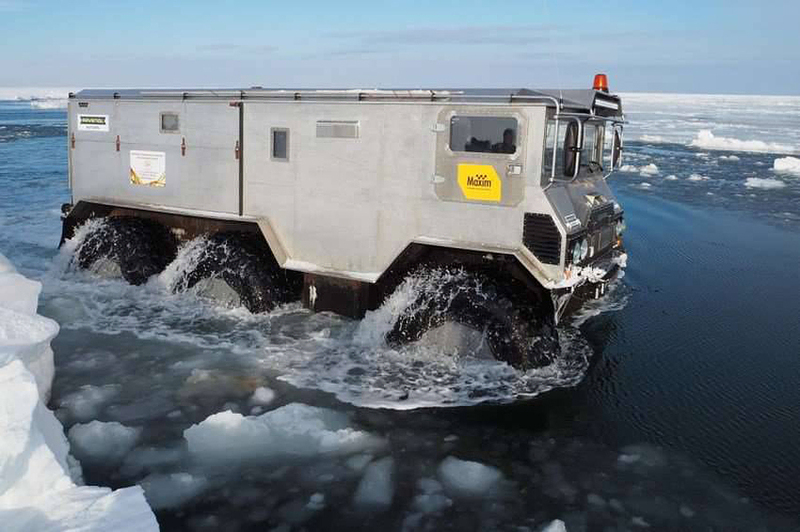 The interiors are fully heated and enclosed, making you feel safe and comfortable in icy conditions. What’s more, charging ports are included for electronics like laptops. 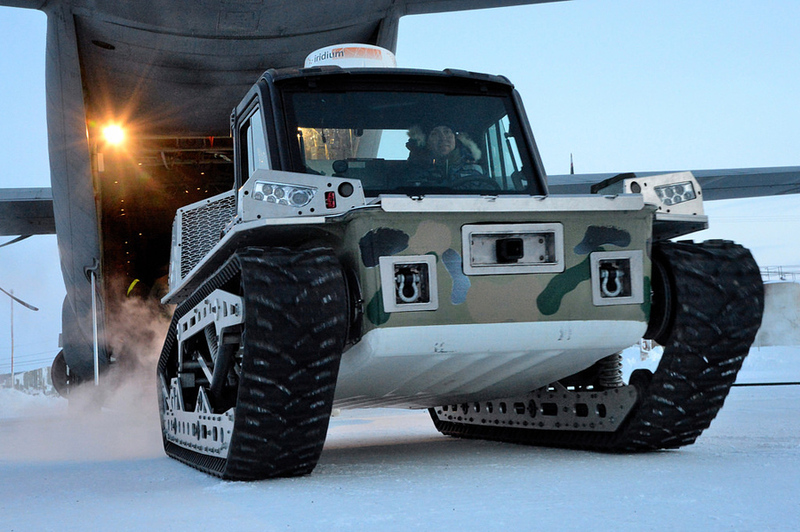 This agile and small vehicle can handle mud, snow, dirt, water, sand, ice, and even Arctic weather below freezing point. 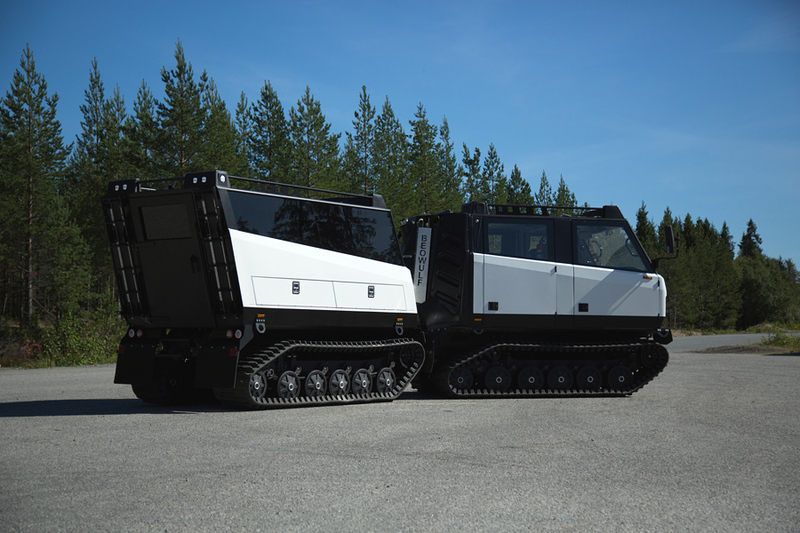 A product of Sweden’s BAE Systems Hägglunds, this amazing ATV features an innovative unprotected platform that draws upon earlier iterations of this model – the Bv206, the Bv206S, as well as the BvS10. 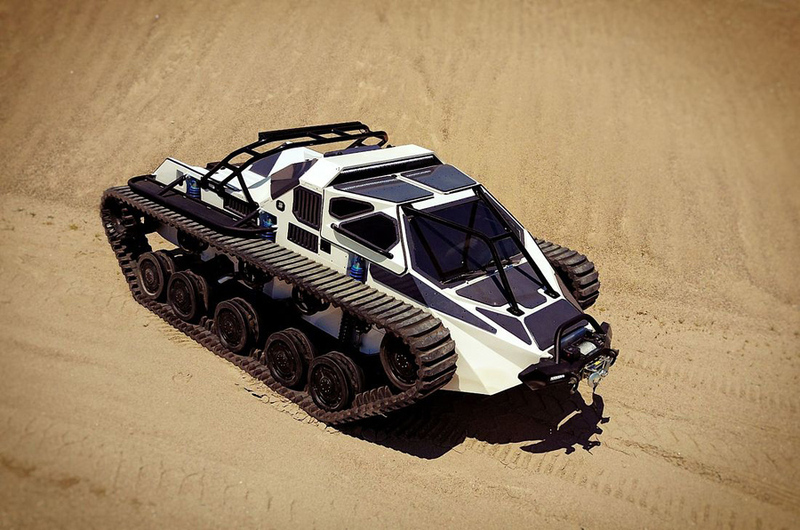 The vehicle is completely configurable and provides improved tactical and strategic mobility. It can be transported across long distances via air or sea. 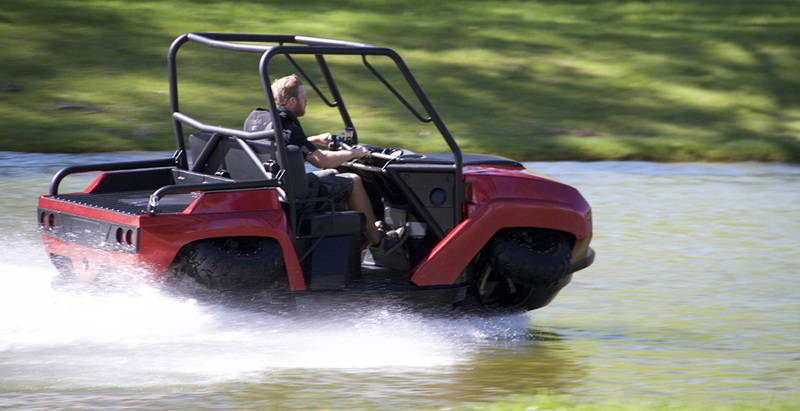 This modern vehicle combines the best in ergonomics and commercial automotive technologies to deliver an ATV that provides unparalleled crew comfort along with minimal maintenance issues. 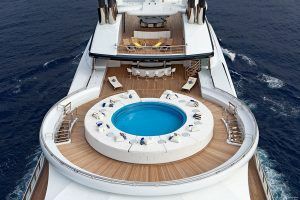 The company sticks to the time-tested chassis and powertrain, and creates a flexible cabin that offers a new-age user interface and design solution. 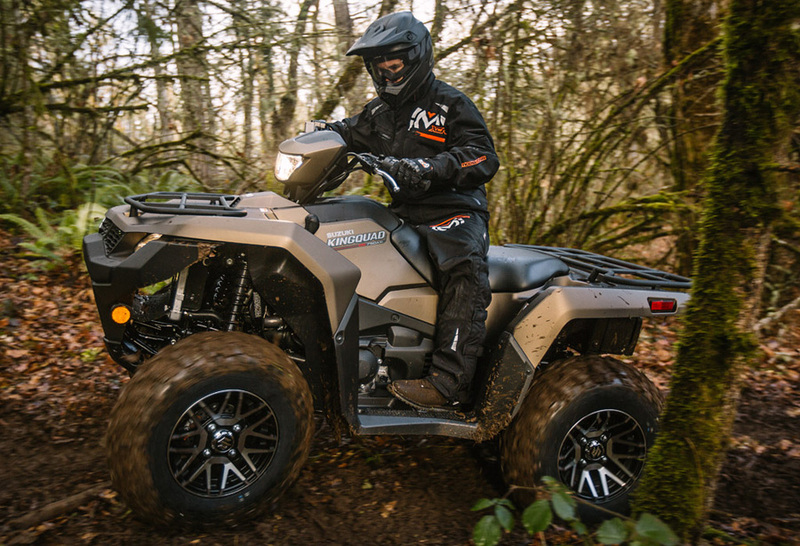 Lightweight four wheel ATVs usually possess great suspension for handling turns, jumps, and bumps. You can modify the quads as per your performance and style needs. These types of vehicles boast enhanced speed over regular ATVs and responsive engine systems. The Grizzly EPS SE comes with ultramatic transmission for enhanced performance. The dual range drive, gated shifter, and reverse gear make it one of the most sophisticated and tough CVT drive systems in production right now. The ideal engine of the vehicle balances strong midrange with big bore power for high responsiveness. The power steering minimizes attack and fatigue while the trail-ready chassis gives you the benefits of adjustable suspension and high ground clearance. The company was thoughtful enough to add the latest Maxxis ‘Zilla tires with 14 inch aluminum wheels for incredible rec utility performance while conquering difficult terrain. Many people are interested in purchasing ATVs due to their utility in hauling large loads and hard labor. If you’re one of them, you will enjoy this heavy hitter from Honda that promises to minimize your burden day in and out. The low-down torque emitted by the liquid cooled engine allows you to tackle difficult terrain with relative ease along with largescale towing activities. The Foreman comes with a triple headlight system that features a single 45 watt upper bulb along with dual 30 watt lower bulbs. There are multi-reflector lenses present as well so that the light gets distributed in optimal fashion. Along with that, the vehicle also features LED taillights or brake lights for better visibility. 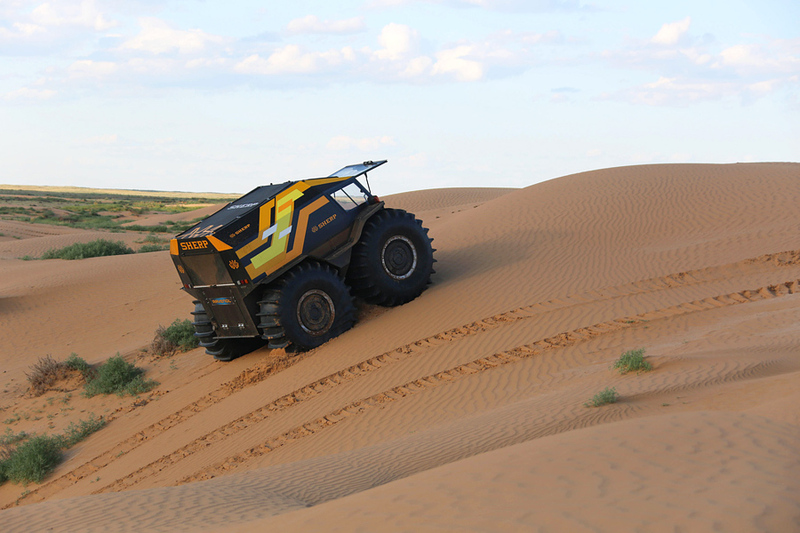 The traction of this vehicle is beyond anything you’ve seen thanks to the inclusion of the TraxLok technology. You can easily choose 2wd or 4wd. While the former offers lighter steering when driving across a level plain, the latter increases the traction of the vehicle to the maximum limit when you require it. The ESP or Electric Shift Program is a thoughtful addition to this vehicle as the rider is now able to switch gears with a simple click of a button. You can change transmissions between automatic operation and ESP and use a column-style shift lever to choose the mode of your choice – Neutral, Drive, or Reverse. Thanks to the PGM-FI fuel injection, you get near crisp and instant throttle response along with cold weather starting and consistent altitude performance. 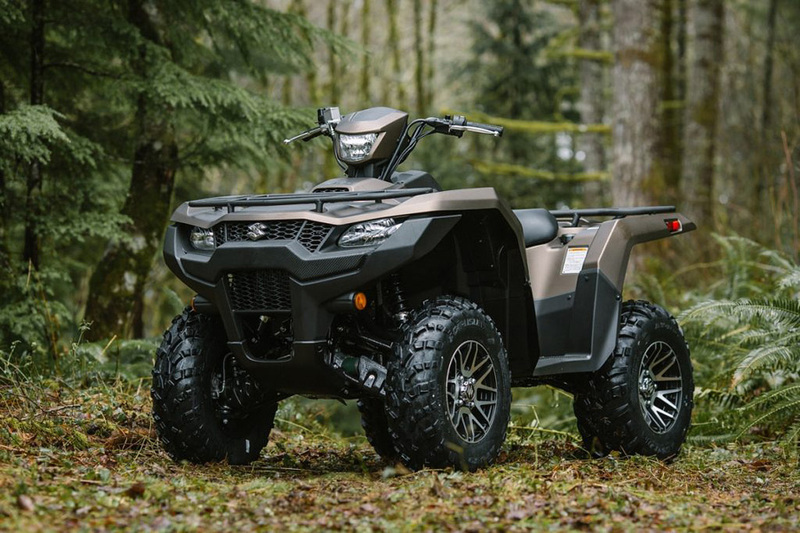 The new ATV from KingQuad is the successor to Suzuki’s best sports utility quad with an impressive, edge matte-finish bodywork and updated specifications. 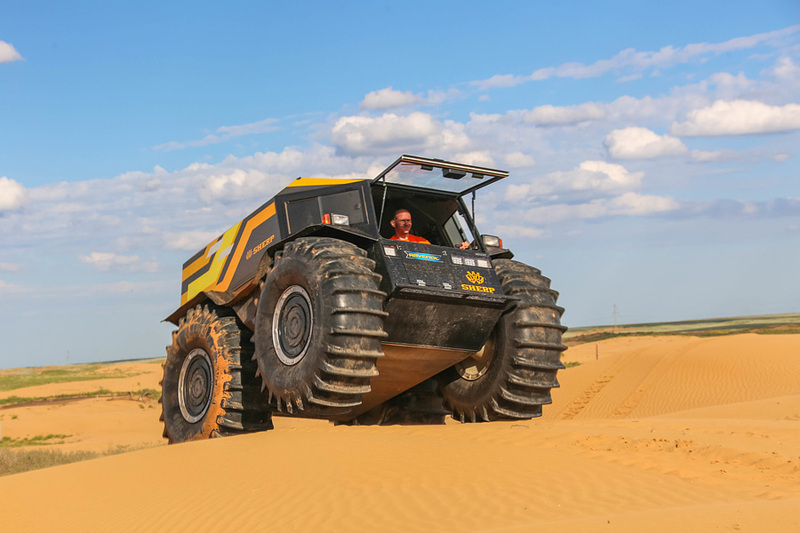 The KingQuadis capable of accelerating strongly and smoothly from a stop position thanks to the emissions-compliant, fuel-injected engine and the company’s proprietary Quadmatic transmission system. The tough, durable frame is perfect for tackling various riding terrain and helping you with different chores thanks to the 1332 pound towing capacity. 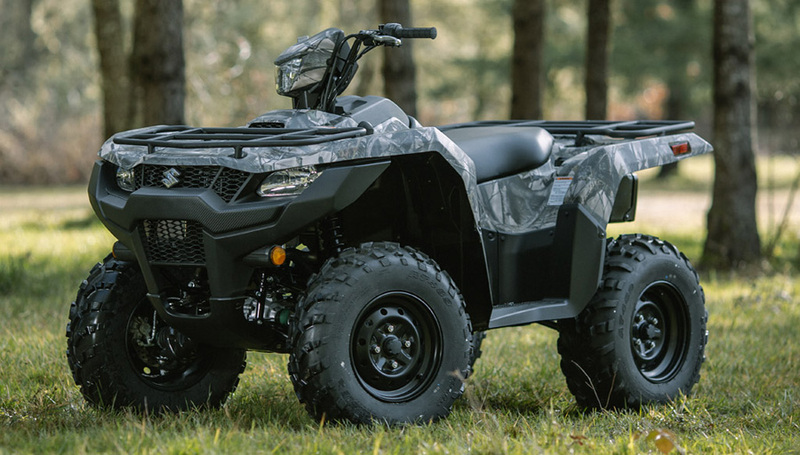 The recalibrated front end geometry and electronic power steering mechanism make handling this ATV a breeze. The suspension works independently and has been equipped with new, gas-charged locks. Controlling the movement of the chassis is also easier thanks to a beefed up stabilizer bar with compliant brushings. The Brute Force 750 from Kawasaki is meant for high performance off-road travel and comes with the best specifications in the industry, such as EPS (electronic power streering) and greater torque. 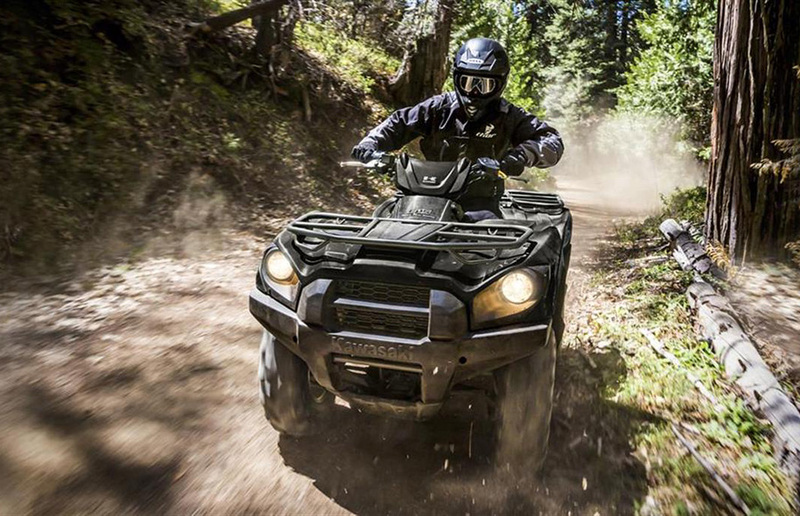 Thanks to the 750 cm3 V-twin engine, the ATV’s performance lasts all day long. The chassis control is excellent and you get access to new features. The transmission is continuously variable. The front is a 6.7 inch while the 7.5 inch rear suspension works independently. 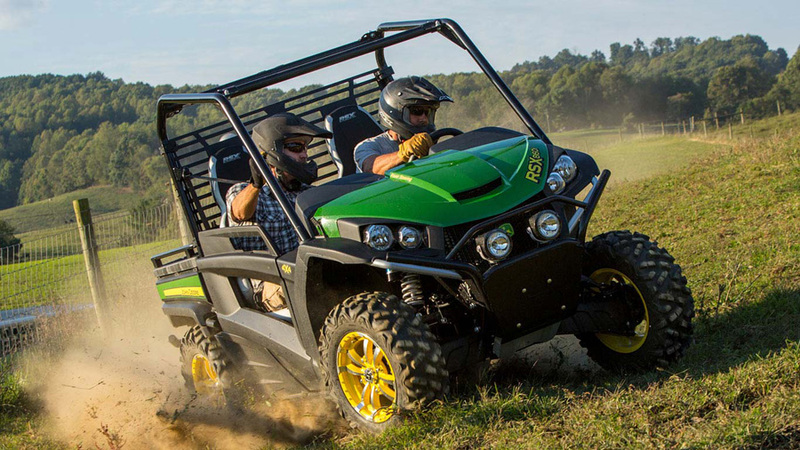 John Deere is known for innovative RUVs, and the company does not disappoint with its latest high performance offering – the Gator RSX850i. 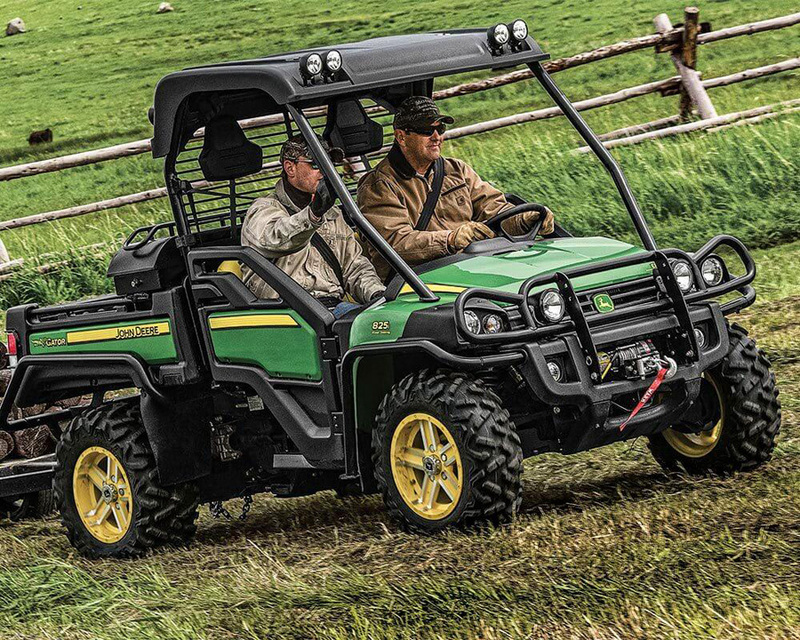 The vehicle provides the handling and performance necessary to maneuver tight off-road turns around your ranch or back country trails. 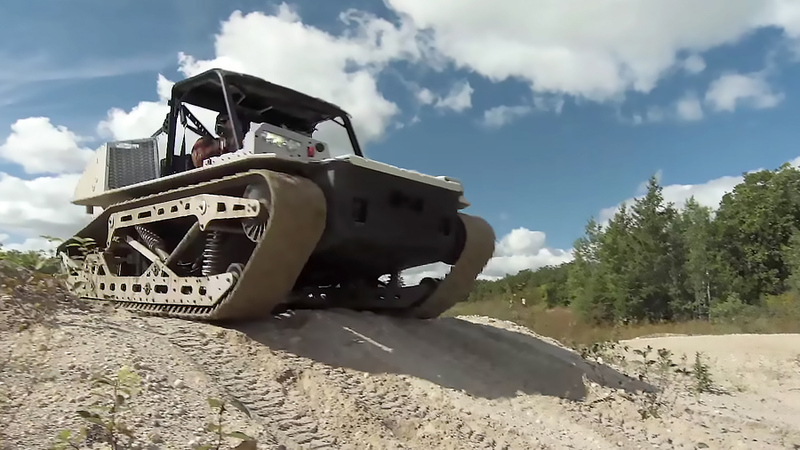 What’s more, the speed of this ATV is top-notch reaching 53 mph, while the payload is 800 pounds. The vehicle has a towing capacity of 1200 pounds and the overall experience is a lot of fun. Which Off Road Vehicles Are the Best? 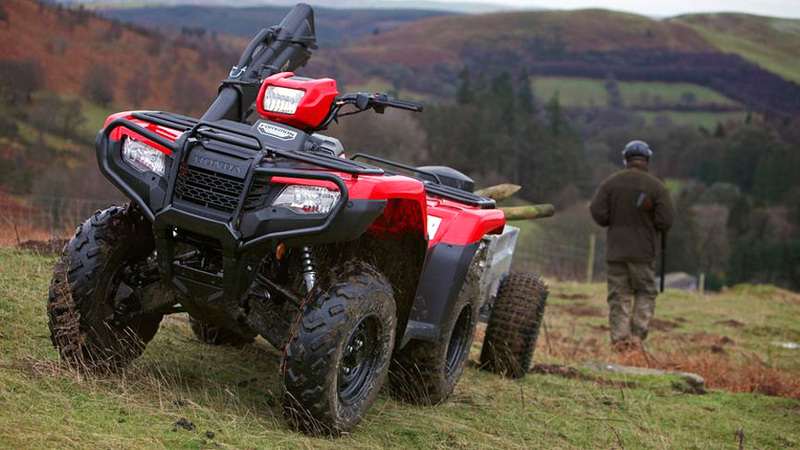 So, there you have it – the 15 best ATVs that money can buy right now. All of these vehicles are available in the market, and you can compare their specifications and testimonials to get a better idea about the one that will suit your lifestyle. Given the sheer diversity of this range, you are bound to find a model or style that suits your personality and age too.